It’s Fabulous, It’s Fruity, It’s Fruit Tumbling! Fruit Tumbling by Novomatic has 5 reels and they are all covered in fruit! This classic-style, fruity slot has 10 paylines in total. Each of the 5 reels has three positions. 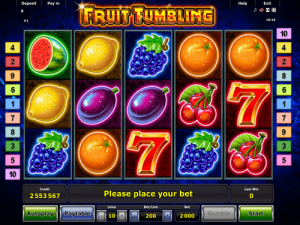 Fruit Tumbling is unmistakeably a Novomatic slot game! The style, the symbols, the logo and the features (including the music) are all typical for the developer. Fruit symbols feature in the game, alongside traditional-style slot symbols, like the red seven and the golden star. This beginner-friendly slot game has Scatters, Wilds, Free Games and a Win Multiplier feature. Win multipliers in the Free Games feature go up to x16! That’s enough to make any ordinary win a huge one! Although it might not be technically or graphically advanced, this slot is a joy to play. That’s because it pays! A slot doesn’t have to look pretty to pay out the big bucks. Novomatic make plenty of similar games but why should they change when they do what they do best? Other great games from Novomatic, that are similar to Fruit Tumbling, include: Ultra Hot Deluxe, Spinning Fruits, Plenty of Fruit 20 Hot, Fabulous Fruits, Fruit Fall and Jolly Fruits. Slot machines are all about getting as many matching symbols as possible! There are 10 unique symbols in Fruit Tumbling and you never know which ones are coming up or how they are going to land on the reels. You can either play manually by pressing ‘start’ each time you want to spin the reels, or you can play in autoplay mode and watch as the reels spin themselves until you stop them. The unique symbols are fantastic and most of them are fruity! There are: cherries, oranges, plums, lemons, grapes, watermelons, bells, red sevens, a golden star Scatter and a jokey jester Wild. One or two matches won’t get you anything in Fruit Tumbling! You have to spin at least three of a kind in order to get wins or free games! 3 of any kind pays out the least but 5 of any kind will pay out a big win – especially from high-paying symbols like the golden bell and the red seven. The paytable displays all the different win amounts for all the symbols. Each symbol has its own payout value for x3 matches, x4 and x5 matches. The matching symbols can’t just land anywhere, though, they have to land on the paylines! These are lines that run across the reels, following different paths and covering different positions, from left to right. That means that all x3 wins will consist of symbols that land on the first three reels (as long as they follow a payline, of course). The jokey Jester symbol gives out the biggest wins of all the symbols! That’s probably why he looks so happy. On top of giving out his own wins, he can also form part of any other winning combination. As long as he lands in a convenient place, he can behave like a substitute and complete any win. The only symbol he’s not able to stand in for is the golden star Scatter symbol. This symbol also gives out big wins. Along with a payout, x3, x4 and x5 Scatter symbols will trigger 15 free games! For the duration of the free games, a multiplier feature will be active and this is what makes the fruit tumble! If you spin a win, the winning symbols will pay out and then disappear. New symbols will tumble in their place and the multiplier will double. If you get another win, the same thing will happen and the multiplier will double again. The maximum multiplier is x16.